Looking for hair extensions in Saskatoon? Yes! We do ship to your city. Most Canada Hair customers in your area prefer to wear clip-in extensions. Clip-in extensions are popular for a reason: they are the easiest solution if you want to improve your hair. You don't need to go to the hairdressers, installing them at home is easy and can be done in minutes. 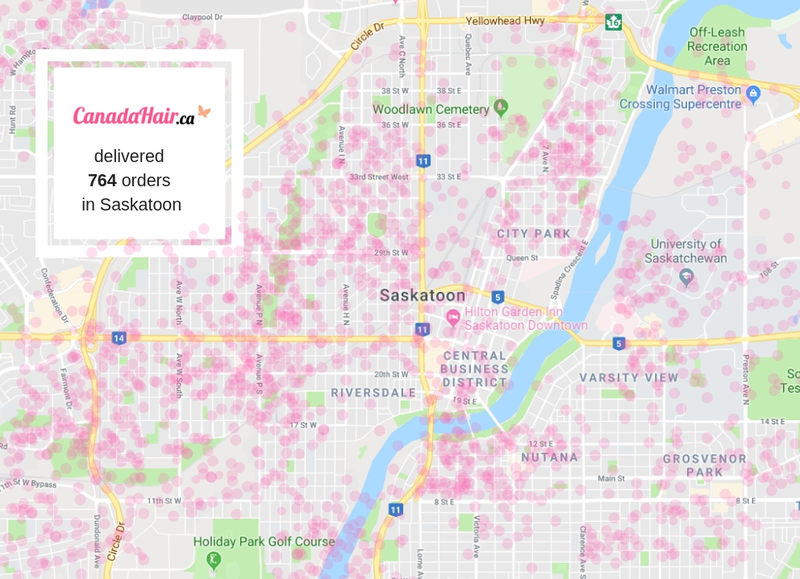 The best extensions in Saskatoon: order online or buy in retail stores? Expensive hair extensions: it is not easy to run a retail store, expenses have to be covered - which usually means they have to sell products at a higher price. Poor color uniformity: colors might differ from set to set. Hair colors may not match: without proper coloring, the match could be well off. No quality control: retailers are not able to control the quality of extensions firsthand as they buy from suppliers. Limited Inventory: the physical store itself limits the range of offers, so you may not find what you are looking for. You might waste your time: it is harder to find a local store, and even harder to find one where you can buy just the right hair extensions. Affordable hair extensions: based on customer reviews, Canada Hair is the leading solution to buy extensions from in Canada. Consistent hair colors: the coloring of our extensions is always uniform. Beautiful colors: all of our products are colored with the right processes, providing a seamless blend. Strict quality control: we do our own quality control: you get to order only the best extensions. Huge variety of choices: we have a very wide range of hair extensions available in our store. Super fast shipping everywhere: all of our orders arrive in 1 to 7 days as we ship everything quickly, from Canada. Hassle-free return policy: if you are not satisfied, we will refund the full price of the product and also pay for shipping it back. Best customer service: have anything to ask us? Our support team is eager to help you! Popular in Saskatoon: with hundreds of satisfied customers, we are a top choice in Saskatoon. You can’t find a better place to buy hair extensions than Canada Hair - that is what our customer reviews say. All our products blend seamlessly with your natural hair as they are made of the highest quality hair. You can always track your online orders online, 24/7. All orders are expected to arrive in 1 to 7 days. Not satisfied? You can return the product following our hassle-free return policy - we not only give you a full refund but will also pay for shipping! We already work with lots of hair salons and shops in your area. We help hair salons in Saskatoon have happier customers by offering them quality products at affordable prices. The easiest and quickest way to get thick, long hair are arguably clip-in extensions. You don’t have to go to your hairdresser, you can simply and quickly install them in your home. You just have to open the clips and attach them to your hair - and you are done. A transformation in minutes, without any stress or wasting time. If you have hair that is thin and fine, these are the most suitable choice for you. Tap-in extensions will allow you to have longer, fuller hair in no time. They are also lightweight, so tape-ins are especially comfortable to wear thanks to their special design. They can also be reused, so they are a cost-effective solution. Micro-loop extensions are the safest considering your hair: every strand has its own loop pre-installed, so attaching them to your natural hair won’t damage it in any way. Without glue or heat, the installation is also pretty easy, it will require you to visit a hairdresser though. In a few minutes, you can get natural-looking, seamlessly blending long and beautiful hair. If your natural hair is coarse and thick, this is the perfect kind of extension for you, specially designed for this type. It holds firmly and comfortably, giving you the wow-factor. Glue is pre-installed on the extension which the hairdresser will melt and install the extension without problem: these permanent extensions are the ones that last the longest. One of the most popular types of extensions among Canadians: you can see fashion models, actresses, influencers wearing them all around. They are also the most cost-effective solution out there: not only they are the cheapest of all hair extensions, but they are also the easiest to install at the hairdressers.